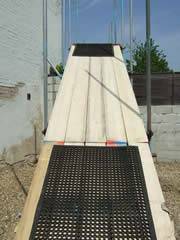 You will require a suitable level base to site your hot tub or spa. 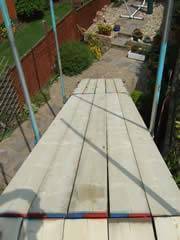 For example this could be concrete slabs, decking, or full concrete slab. 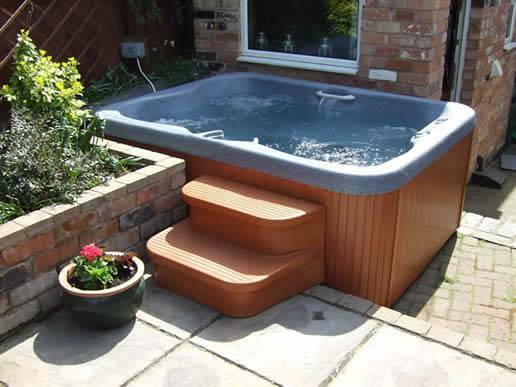 Hot tubs or spas cannot be sited on grass or uneven ground. 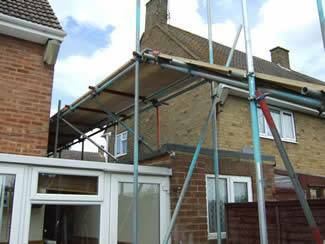 For customers in the Leicestershire area a free site survey and consultation is offered. 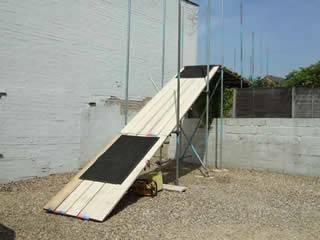 We can also offer a full base construction, quotes available on request. We strongly recommend you have a waterproof electrical isolator switch next to or near the hot tub or spa site. This must be fitted by a qualified electrician. 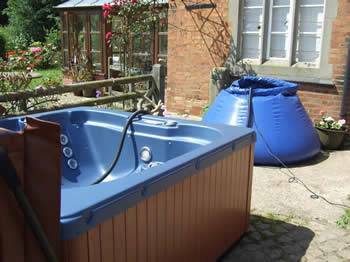 Some larger hot tubs and spas require armoured cable which also must be installed by a qualified electrician. Please consult us as to the exact requirements for the hot tub or spa in question. There must be an appropriate electrical supply 13/16, 32 or 40 amps depending on the spa. This must be wired through an R.C.D (or circuit breaker) usually 2 meters away from the Spa. Any buried or exposed cable should be armoured and should terminate next to the site of the spa. Please leave enough cable for our fitters to connect the cable to the control box. The cable will enter the cabinet at any corner of the Spa until it reaches the control box. Which is situated in the middle/front of the side of the Spa showing the control pad. We recommend that all electrical work be carried out by a qualified electrician. There must of course be a suitable water supply to fill the hot tub or spa within the site area. 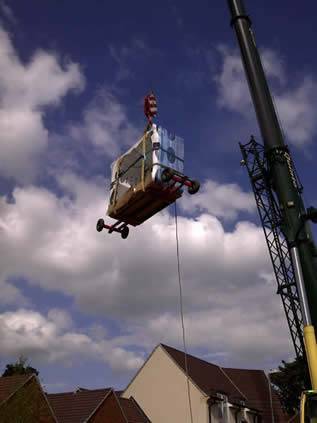 Upon delivery the hot tub or spa will be placed on a dolly truck ( Trolley ) sideways. Please be aware that access from the roadside to the site is required. Furthermore gateways, alleyways, pathways and carports etc should be taken into consideration. Please consult us as to the exact requirements for the hot tub or spa in question prior to delivery. 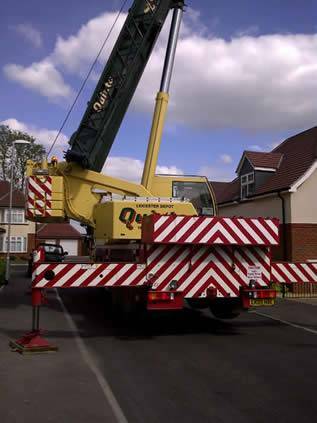 Alternatively should access be a problem the use of a crane maybe required. The cost of which shall be the responsibility of the customer not Leicester Hot Tub Hire Ltd.
1. Are doorways, gateways, alleyways and pathways wide enough? 2. Will access be over or across garden or grass. 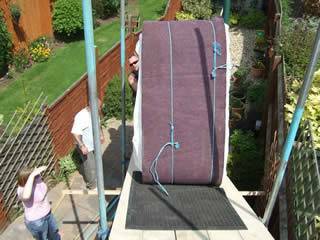 Which will mean taking the hot tub or spa off the dolly truck, will boards or protection be needed? 3. Be aware of drainpipes, guttering, shelves, taps or any obstruction on route to the site. 4. Turning space will be required around corners through alleyways etc. Therefore will there be room enough to turn. 5. 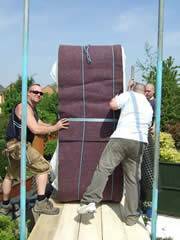 We will supply 2 men to install the hot tub or spa. Should more labour be required this shall be supplied by the customer, at the customer’s cost. Likewise be aware of slopes, walls or difficult routes to the chosen site. If extra labour is needed this should be arranged prior to delivery. Should the customer not be able to arrange extra labour, we will if given sufficient warning to arrange it. 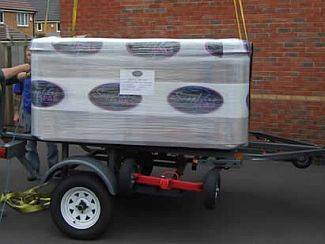 The cost of which shall be met by the customer not Leicester Hot Tub Hire Ltd.
6. 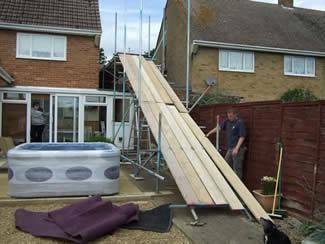 Once sited, access will be required around the hot tub or spa to assist in the installation and set-up etc. Not all installations are straight forward: sometimes it’s a challenge. 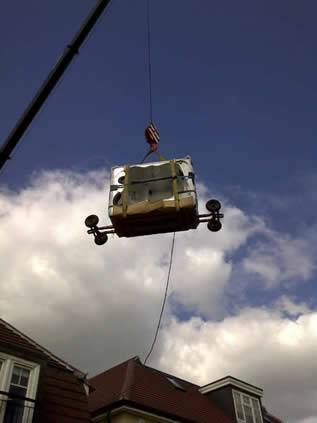 However if its possible to get that spa in, Leicester’s premier Hot Tub and Spa company will do it! 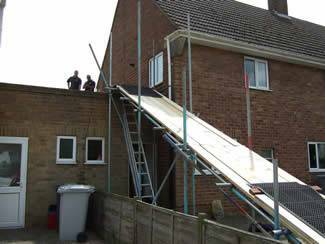 Firstly -up the scaffolding ramp. 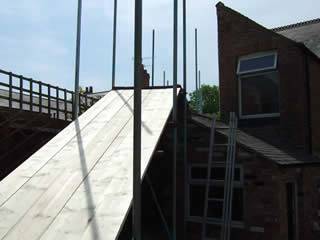 Thirdly -down the scaffolding ramp. Finally -a very happy customer. With a little planning, nothing is impossible! Do you have poor or low water pressure? If so we have our Conical Tank which can speed up the installation. 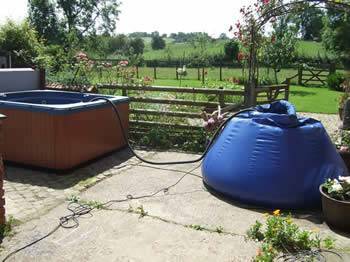 And if you have poor water pressure, we can send the tank to your home address you fill it the day before the spa is due to arrive. Finally once the spa is sited we can pump the water from the Conical Tank into your hot tub. 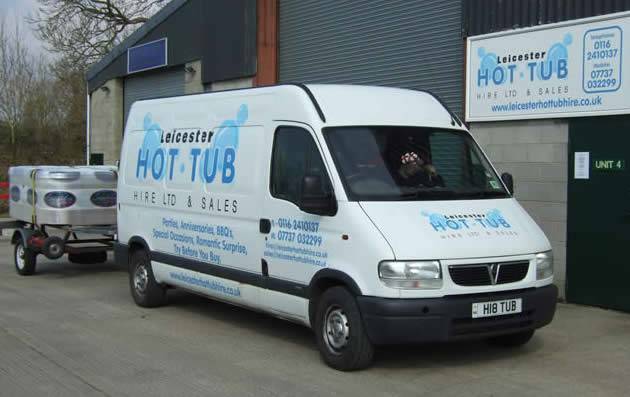 Hot tub delivery in Leicestershire and Rutland will include free installation and setup. 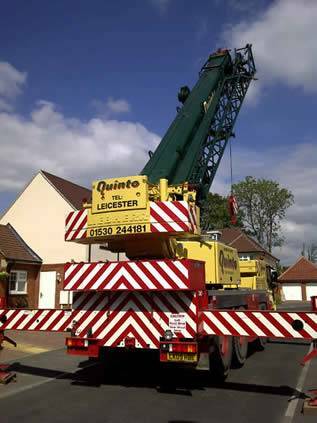 Please consult us for delivery and setup costs outside Leicestershire and Rutland.